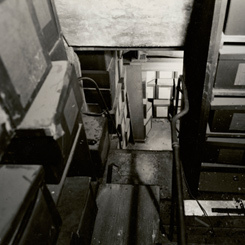 Image courtesy of National Archives and Records Administration An obscure, small staircase led to the Capitol attic room which for years served as storage space for early House Records. On this date, H.R. 11212, in which the House of Representatives took its first step toward the long-term preservation of its records by providing funding for document storage in a general appropriations bill, became law. The Clerk of the House, former Congressman Alexander McDowell of Pennsylvania, initiated the change. On January 23, 1899, McDowell presented a plaintive letter from file clerk Walter French detailing the immediate need for more and better storage space for the files of the House (H. Doc. 170, 55th Cong., 3rd Sess.) “The extreme heat in summer from the iron roof and the dampness in winter from the condensation of hot air coming against the cold iron of the roof renders the place unfit for documents of such value,” French explained. “Portions of the shelving in the attic are of wood, and in the event of fire would be entirely inaccessible, as this attic can only be reached through this office and up three flights of narrow stairs.” However, Congress adjourned early and did nothing to correct the storage deficiencies. On March 27, 1900, McDowell again presented the letter requesting more storage (H. Doc. 536, 56th Cong., 1st sess. ). This time Congress acted swiftly, and the appropriations bill included a provision for $1,500 for the transfer of inactive records to the Librarian of Congress. In 1901, 5,502 volumes of "journals, miscellaneous documents, executive documents, bills, reports, committee books, and records of the office of the Clerk" from the 1st to 56th Congresses (1789–1901) were sent to the Library of Congress.